I have a little Singer Featherweight sewing machine that I actually use. She isn't an ornament on a shelf; she has to earn her keep! 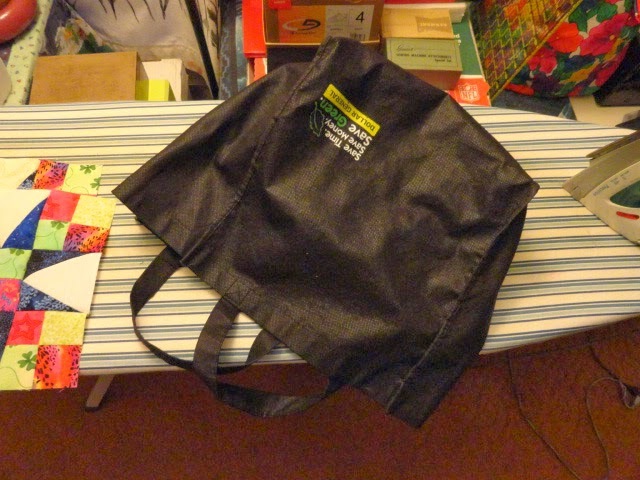 At a recent guild meeting I picked up a shopping bag off the free table. This was a cheap one from the local Dollar Store. 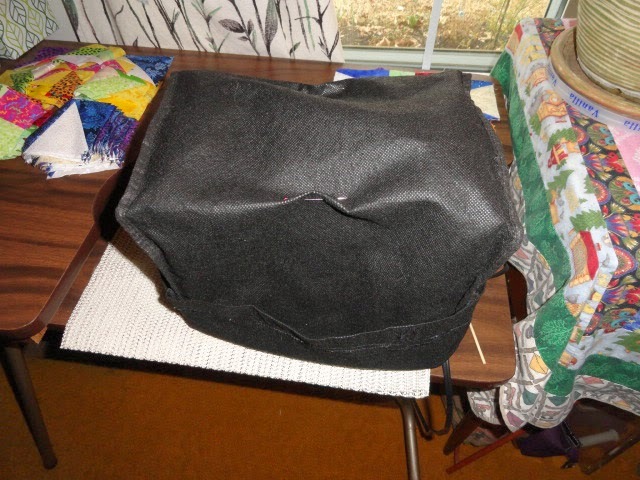 I brought it home and noticed that it needed one seam restitched so I set it in the studio for a few weeks. Yesterday I went to fix the bag and noticed that it had a wider bottom as compared to narrower bottomed ones I had seen elsewhere. I glanced over to the table where the FW is set up and thought, "Gee, I wonder if this bag would fit over the machine?" It fits over the Featherweight! I folded up the bag to see how much I needed to shorten it and pinned it in place. 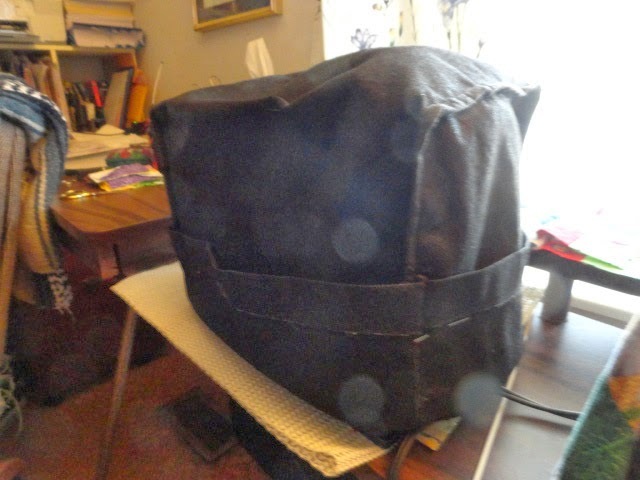 I pinched the sides of the top and pinned. I wanted to have a way to grab on to the cover when removing it from the machine. I thought that having a pinched seam there, would do the trick! I thought about having pockets for accessories and decided against it. They would have gaped open and collected dust. I really wanted a simple dust cover to put over the machine when it wasn't being used. 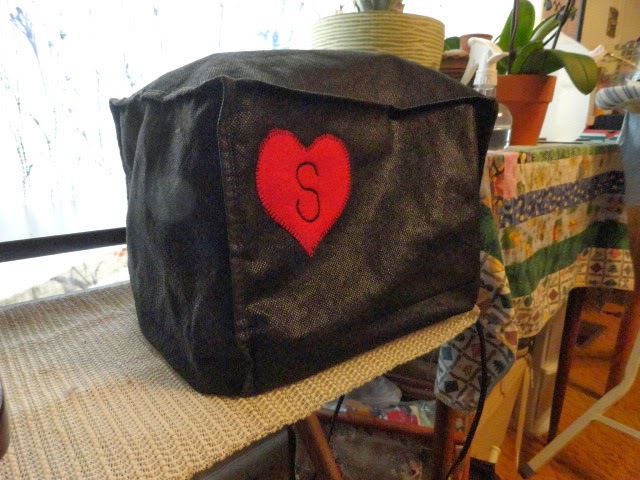 I wanted to cover the Dollar Store's logo so I took a scrap of red felt and cut out a heart. 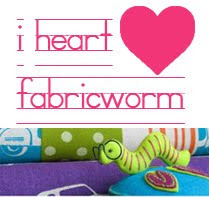 With tear-away stabilizer behind, I used a blanket stitch to sew the heart down. 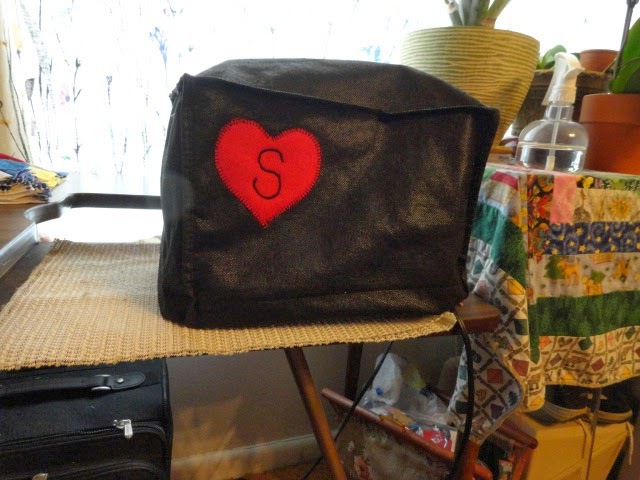 I then used a satin stitch setting to make the letter S.
The S could be for Singer or for Sherri! There you have it! This is a super easy, super inexpensive cover for your little FW. Absolutely adorable and so clever! Thanks for taking the time to post it. Sherri, Wow, what a GREAT idea!!! I'm glad you shared it on the Yahoo Featherweight group. I could see customizing many different covers. :) Thanks SO much! Great idea, Sherri! I am going to try that out if I can find a cute enough shopping bag. Btw, for my bigger machines (Kenmores), I use a standard pillowcase with half of it tucked inside the rest, closed end up. I align the open end of the pillowcase with the top seam. I love it because I can use an old pillowcase that's sitting around in the linen closet, it's washable, and I can embellish it if I want to (I haven't, but I could!). I'm going to try your idea for my FW, though! Thanks! Good idea on the pillowcases. I liked this bag because it was somewhat stiff and had some body to it too. It is washable as well. Just what I've been looking for! 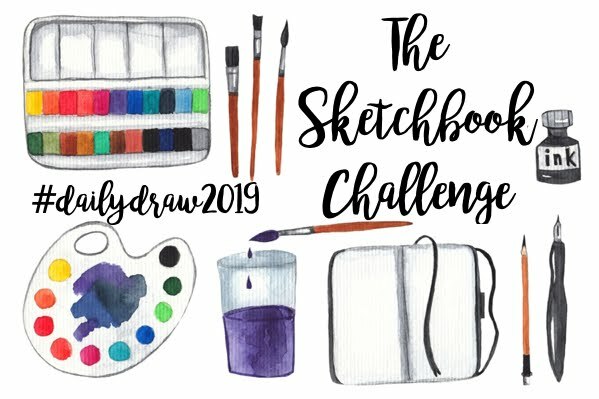 I'm doing this! One for each sewing machine! Thank you! Thanks Barbara! Just to clarify, the FW has its end flipped in the up position. The bag is too small to use over the complete machine when it is wide open. 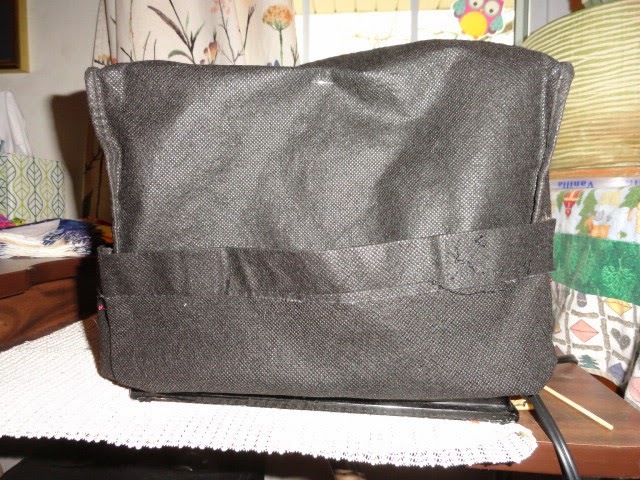 Went to my local dollar store today to get one of these bags for MY Featherweight; turns out the store manager has a white/green Featherweight of her own, and knows how to maintain/repair it! That is so clever, Sherri! I love it! 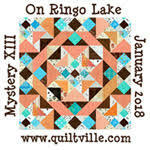 I keep "meaning to" make machine covers, "when I get around to it," but then my mind goes 90 mph with all kinds of fancy, extravagant ideas for a cover that is quilted and embroidered and monogrammed and beribboned and bedazzled and then I'm tired just THINKING about it and it never gets done. :-) But now you've got me thinking. My grocery store has sturdy little canvas tote bags with internal dividers meant for 6 bottles of wine. I wonder if I could remove the dividers and use one of those bags to transport my Featherweights? It's definitely strong enough.